Over 550 years ago Franciscan friar Marcos de Niza and Francisco Vasquez de Coronado both failed to discover the wealth of the Seven Cities of Cibola. Today, the wealth of Arizona can be found in the startling natural wonders of the state, in vast mineral reserves, in the healthful climate and in the rich cultural heritage of the "Pueblos". One of the "Seven Natural Wonders of the World", the Grand Canyon attracts nearly five million visitors each year and Monument Valley's sandstone monoliths have served as the breathtaking backdrop for many classic western films. Arizona leads all states in the production of copper and non-fuel minerals. From about 700 A.D. to 1200 A.D. the Pueblo (Spanish for village) people flourished, building the great communal cliff dwellings that today, serve as testament to a remarkably unique culture. This state with a tumultuous past was also the home of Geronimo and Cochise and set the scene for the "Gunfight at the OK Coral" where the score was finally settled between the Earps and the Clantons. It's said that a mining speculator named Charles D. Poston first suggested the name Arizona in a petition to the United States Congress to make Arizona a legal territory. Pimeria was in reference to the land of the Pima Indians of the region. Gadsonia was a Latin adaptation of the surname of James Gadsden. This suggested name is rooted in one man's dream/scheme to establish a southern transcontinental railroad running from Florida to the Pacific coast. Underlying this idea was Mr. Gadsden's desire to make the western territories economically dependent on the southern states rather than the northern states. James Gadsden was appointed U.S. Minister to Mexico and instructed to purchase, from Mexico, a strip of land south of the Gila River and lying in what is now southwestern New Mexico and southern Arizona. The Gadsden Purchase formalized the deal, providing Mexico with $10,000,000, the United States with 45,535 square miles of land and a clarified the U.S./Mexico boundary. The Gadsden Purchase also provided James Gadsden with a route for his transcontinental railroad. Click here for more about the Gadsden Purchase. 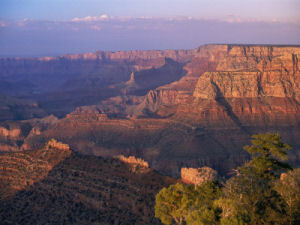 This popular nickname for Arizona references the incomparable Grand Canyon in the northern part of the state, one of the world's natural wonders. Producing more copper than any other state in the union, the Copper State is an apt nickname for Arizona. This nickname is reinforced by the copper star that is at the center of the Arizona State Flag. 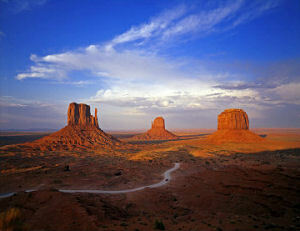 Arizona was referred to as the Apache State because of the great numbers of Apache that lived in the territory. The Apache people fought bravely to keep newcomers from the state for many years in the 19th century. This nickname was probably in reference to the Aztec place names found in the Gila and Salt River valleys. Some of the ruins along these rivers may have been built by the Aztecs. For a period of time, Arizona was the "baby" of the republic. It was the last of the contiguous 48 states to be admitted to the union in 1912. It was another 47 years later that Alaska and Hawaii gained statehood. Happy Valentines Day! Yes, Arizona has been referred to as the Valentine State because it was admitted to the union on February 14th! The Italy of America nickname compares the beautiful and scenic mountain regions of the state of Arizona with the mountains of Italy. This nickname is a reference to the desert-like appearance of many areas throughout the state. This nickname most certainly stemmed from the beautiful sunsets throughout the state and particularly at the Grand Canyon. Arizona does provide a magnificent foreground for dramatic sunsets. "Sunset Land," a variation of the Sunset State, has also been recorded. Patrick Hamilton, in his book, The Resources of Colorado, published in 1884, stated "...there is no region on the globe, not even excepting he Italian peninsula, that can show such grand effects of light and shade, such gorgeousness of coloring, or such magnificent sun-bathed landscapes. When the banks of clouds around the western horizon look like masses of burnished gold set in a sea of silver, then is presented a picture to which neither pen nor pencil can do justice." People who live in or come from Arizona are referred to as Arizonans. According to A Book of Nicknames, by John Goff, published in 1892, Arizonans were sometimes referred to as "Sand Cutters" by people from outside the state, but it is not clear how this nickname for the people of Arizona came to be. The third commemorative quarter-dollar coin released in 2008 honors Arizona, and is the 48th coin in the United States Mint's 50 State Quarters® Program. Arizona was admitted into the Union on February 14, 1912, becoming our Nation's 48th state, and the last in the continental United States. The Arizona Quarter Commission, appointed by Governor Janet Napolitano, solicited design suggestions from across the State. The Commission narrowed down more than 4,200 ideas to five narratives, which were sent to the United States Mint for consideration. The final artistic renderings, developed by Sculptor-Engravers of the United States Mint and artists in the United States Mint's Artistic Infusion Program, were then proposed to Arizona, and a statewide online vote was conducted. On May 1, 2007, Governor Napolitano announced her recommendation of the "Grand Canyon with Saguaro Cactus" design, based on the results of the online poll. The Department of the Treasury approved the design on May 25, 2007. The other design concepts considered during the final selection process were "Grand Canyon," featuring an overview of the Grand Canyon; "Grand Canyon with Saguaro Cacti," featuring the Saguaro cactus as the central design with the Grand Canyon in the background; "Powell's Grand Canyon Expedition," depicting the John Wesley Powell expedition in a boat going through rapids; and "Navajo Code Talkers," depicting two Navajo Code Talkers using World War II field communication equipment. Arizona (From Sea to Shining Sea) , by Carol K. Standard. 80 pages. Publisher: Scholastic Library Publishing (March 2002) Reading level: Grades 3-5. Presents information about Arizona's people, geography, history, landmarks, natural resources, government, state capitol, towns and cities, and more. Arizona , by Michael A. Martin. 48 pages. Gareth Stevens Publishing (October 2002) Reading level: Grades 4-6. Filled with the most up-to-date information, including the latest Census results. Full-color photos bring to life the story of Arizona. In addition to an in-depth factual profile of Arizona in the form of a state Almanac, this book offers fascinating and lively discussions of the state's history, people, geography, government, economy, culture, and lifestyles. A section on Notable People, a calendar of events, and enough primary source documents, time lines, maps, and other tools to make this unquestionably the best young adult reference material on the USA available anywhere. The Great Arizona Almanac: Facts about Arizona , edited by Dean Smith. 240 pages. Westwinds Press; 1st edition (October 5, 2000) The Great Arizona Almanac is an essential read for anyone wanting the latest, greatest scoop on the history, geography, economy, and people of the Grand Canyon State. Filled with photographs, illustrations, maps, and up-to-date information, this comprehensive source will intrigue anyone wanting to know more about this amazing state. Editor Dean Smith, a former newspaper reporter and columnist, served as Director of Publications for Arizona State University for more than twenty-five years. He has written sixteen books and more than two hundred magazine articles. He lives in Tempe and Prescott, Arizona. Arizona: A History , by Thomas E. Sheridan. 434 pages. University of Arizona Press; First edition (February 1, 1995) Thomas E. Sheridan has spent a lifetime in Arizona, "living off it and seeking refuge from it." He knows firsthand its canyons, forests, and deserts; he has seen its cities exploding with new growth; and, like many other people, he sometimes fears for its future. Arizona: A History explores the ways in which Native Americans, Hispanics, and Anglos have inhabited and exploited Arizona from the pursuit of the Naco mammoth 11,000 years ago to the financial adventurism of Charles Keating and others today. It also examines how perceptions of Arizona have changed, creating new constituencies of tourists, environmentalists, and outside business interests to challenge the dominance of ranchers, mining companies, and farmers who used to control the state. Sheridan emphasizes the crucial role of the federal government in Arizona's development throughout the book.